Looking for months of reading time from your smartphone or tablet? E-paper display technology may soon satisfy your needs. Four competing, emergent technologies are already rolling off production lines and into marketplaces. Before you know it, your next smartphone may be fitted with an e-paper display. Some are capable of real-time full motion content, whereas others require a screen refresh. Others possess full color capability. Of those available, here are the top four. E Ink technology (created by the eponymous E Ink corporation), remains the most commonly used screen technology for e-readers in today’s market. Almost every non-LCD e-reader uses it from the Kindle Paperwhite to the Nook Simple Touch. While feature poor and plagued with readability issues Kindle Giving You Trouble? Three Easy Fixes and Troubleshooting Steps Kindle Giving You Trouble? Three Easy Fixes and Troubleshooting Steps The Kindle range of e-readers from Amazon are excellent, lightweight devices that enable you to carry your library of books around wherever you go – but what happens when a Kindle goes wrong? Read More , battery life and low eye-strain make up for E Ink’s shortcomings. Unfortunately, device manufacturers specifically block E Ink screens from operating as tablets, for unknown reasons, making the technology difficult to adapt to smartphones. Fortunately, there’s already a mobile phone that uses a dual E Ink/LCD design, the Russian-designed YotaPhone. The YotaPhone uses an E Ink back combined with a LCD front screen. The Triton 2 E Ink screen technology offers a full-color e-paper reading experience. While, like E Ink, it doesn’t normally support video playback, it uses a fraction of the energy of LCD screens. It achieves its color display in a similar manner as black and white E Ink screens: It can run a charge through a matrix of oil, switching between white and black colors. It then runs a thin film of red-blue-green (RGB) pixels over the oil matrix. When ambient light strikes the surface of the Triton, it will then reflect from the oil matrix, if it is white. On the downside, the small production numbers don’t allow for low prices. Triton E Ink is extremely expensive. Currently, the only e-reader to use it is produced by Ectaco: the $500 Jetbook Color 2. Also, the refresh rates are comparable to regular E Ink screens, meaning they have jarring page turns. The Mirasol display remains one of the most ingenious and promising e-paper technologies available. It combines both adequate resolution with full-motion color display. There’s a slight silver tint to a Mirasol screen, but otherwise, they appear similar to LCD in terms of picture clarity and refresh rate. The actual name of the technology behind Mirasol is interferometric modulator display. It changes its pixel’s colors in response to an electrical signal, meaning it generates colors through reflection rather than emission. The electrical signal isn’t continuous, except when full motion display is required. Mirasol doesn’t require a constant stream of power, except to operate the backlight. Unlike LCD tech, the backlight is only needed indoors and at less intensity than a traditional LCD screen. Mirasol also suffers from an extraordinarily high price. The few devices that were made using its technology were limited to Asia and were priced at over $300. Although a clearance sale eventually dropped the price on some devices to around $100. The upcoming version of Mirasol (Mirasol 2) improves on the refresh rate and screen resolution. In fact, screen resolution received a bump to 2,560 x 1440 (577 pixels per inch), making it vastly superior to even Retina displays. The successor technology will likely be used on smartwatches, in addition to other mobile devices. While technically not electronic paper, Pixel Qi has the same advantages of E Ink, but with absolutely no issue displaying full motion video. Pixel Qi technology reorients the positioning of the various filters between the backlight and the front of the screen. It also uses a lens-like plastic grating to cover the screen. This feature allows a dramatic reduction in energy drain. It also makes the screens daylight readable. According to Mary Lou Jepsen, the former CEO of Pixel Qi and now Google employee, 80% of the energy used in current LCD displays is blocked by filters and other LCD components. Pixel Qi’s low energy consumption owes in part to it being able to display black and white in sunlight and full color with a backlight. It can also dim its backlight well below that of LCD screens. Pixel Qi’s biggest advantage over e-paper technologies is its potential cost: It can readily adapt to current production methods for LCD screens. In short, Pixel Qi can piggy-back on the economies of scale enjoyed by LCD manufacturers with low production costs. Second, it is already a deployable technology with screens being used in a variety of ruggedized tablets, including an early variant in the OLPC‘s XO-1 design. Sunlight readable, ultra low-power display screen technologies will make their way into your tablets, smartphones and laptops. Right now, E Ink screens allow tablets to operate for months at a time, rather than a few measly hours. 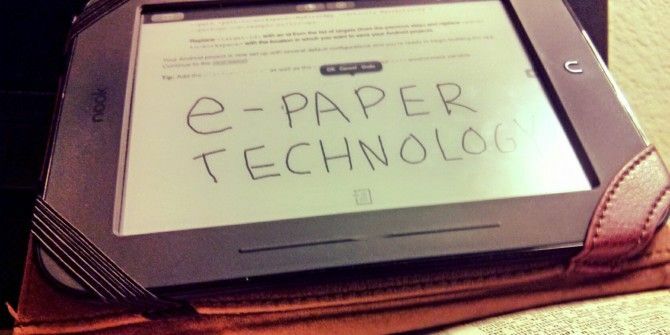 We’ve discussed which e-paper technology is the best before, but what do you think? Anyone own an e-paper, or e-paper-like device? Let us know in the comments. Hey Frank, thanks for the comment. E Ink owns the IP, to my knowledge. The person who could put you in touch with the right people, though (if they exist) is Nicolas Charbonnier, AKA "Charbax". He is connected to a large number of Chinese manufacturers, some of whom might manufacture E Ink screens, or E Ink alternatives. For a smart-watch, though, it looks like Mirasol is going to make a big impact, although with a high price. It's too bad, as I think Pixel Qi could have been a real contender. How do emulate my cell phone's display using mini USB to drive an E-Ink display?